Andover Town Hall is located at 36 Bartlett Street, Andover, MA 01810; phone: 978‑623‑8225. Photo: William Perrin House, ca. 1850, 464 River Road, Andover, MA. Listed on the National Register of Historic Places in 1982. Photographed by User:Magicpiano (own work), 2012, [cc-by-3.0 (creativecommons.org/licenses/by/3.0)], via Wikimedia Commons, accessed December, 2013. Andover, unlike many New England towns, was not built around a central green. The larger settlement, originally called "Cochichewich," began in what is now North Andover, with a gradual and informal movement southward. Development of the present Andover has consequently been much more varied than most centralized towns. Andover's first settlers established a network of roadways radiating from a center point on the Shawsheen River. Although the population was concentrated near the Shawsheen and Haggetts Pond, most of today' s major thoroughfares are indicated on an 1830 map and were well-developed even in the 18th century. These roads still contain many notable examples of Andover's First Period, Georgian, and Federal architecture. Most of these early farmsteads survived until the early 20th century. This diffuse pattern of growth began to change early in the 1800s, when the four falls of the Shawsheen began to attract industrial development, and Academy Hill became a major intellectual center. Nineteenth century Andover is characterized by self-contained centers of activity which were distinguished by peculiar geographic, economic, and cultural features. A small, multifunctional downtown grew around Elm Square, at the intersection of Elm, North Main, Central, and Main Streets. During the last quarter of the 19th century and early 20th century, a small grid of streets was inserted east of Main and North Streets. Relatively dense Victorian suburbs were built for an increasingly numerous and prosperous citizenry. 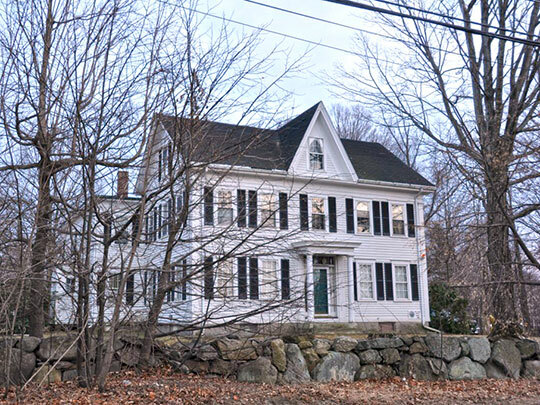 Andover today—as in the past—contains mostly single-family residences, comfortably sited and carefully landscaped with street trees and other plantings. The Shawsheen River is regularly punctuated by crowds of 19th/early 20th century industrial buildings, which also tend to be picturesquely sited. Located off Routes I-93 and 495, modern industrial parks are large but well set back from roads and horizontal in orientation. The small central business district in the middle of town is low and linear, and dates mainly from the early 20th century. Considering its tremendous population growth of recent years, Andover still contains a remarkable amount of open space — whether momentarily undeveloped or whether part of the one-fifth of Andover's land area officially conserved in reservations and a state forest. Andover contains an interesting variety of architectural styles of almost every description. The town is well-known for its "Colonial" character: a number of First Period, Georgian, and Federal style buildings reinforced by a 20th century preference for Colonial Revival. Its best-developed architecture, however, is mid-Victorian in style: Greek Revival, Gothic Revival, and early Italianate/Romanesque, reflecting an era of great prosperity and energy. Subsequent development is most inventive in the Shingle Style of the downtown area and in several widely scattered Bungalows. Seven historic districts are within the town, based on historical patterns of use, visual cohesion, architectural quality, and degree of representation of local history. These seven districts encompass the residential, agricultural, industrial, educational aspects of Andover, although the last two are emphasized. Most of the districts are historically and architecturally heterogeneous; each reflects local history in a distinct way. Academy Hill has always been the center of Andover's most famous activity, education. Physically largest, the area contains virtually all of the Phillips Academy, former Abbot Academy, and former Andover Theological Seminary campuses. The district is also distinguished by its many high-style, architect-designed buildings. Ballardvale is an early mill village and the town's most complex planned community. Its small-scale, vernacular structures were built contemporaneously in a delicate harmony of styles. Central Street has long been Andover's most prestigious residential neighborhood, with the town's most ostentatious homes. Three churches add to the architectural and social importance of the area. The Main Street/Locke Street District blends a variety of styles within an integrated streetscape. This district particularly represents the cultural connections of middle-class farming, business, and academy life. The Andover Village Industrial District — Marland Mills, Tyer Rubber Company, and Abbott Village — contain the earliest extant industrial structures in Andover. Numerous factory buildings are complemented by multifarious streetscapes of modest worker housing. Shawsheen Village, a planned community of the early 20th century, is distinguished by its single architectural style (Colonial Revival) and its executive-level orientation. West Parish Church was the religious and social center for a quiet farming community. Georgian and Federal style homesteads dominate, but a few later styles are found in particularly exemplary designs. Wendy Frontiero, Andover Historical Commission, Town of Andover Multiple Resource Area, nomination document, 1982, National Park Service, National Register of Historic Places, Washington, D.C.